We've finally made it! Oh, what a wonderful time our 1st grade class has had preparing for our KIDLINK voyage! We are from Delmar Elementary School in Delmar, Maryland. My name is Mrs. Claire Campbell and if you read on you will meet my wonderful class!!! 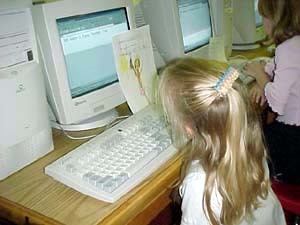 We spent two weeks typing in our KIDLINK information and now we can send it to you. We are very excited about this project and are looking forward to future correspondence. 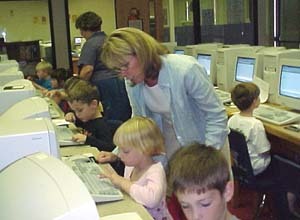 We LOVE going to The Write Place computer lab and learning how to type, open files and save files. What a learning experience. We hope to hear from others and will talk to you again soon!! My name is Raven. I am 6 years old. I like playing outside. When I grow up I want to be a teacher. My name is Ashley. I am 5 years old. I like to eat. When I grow up I want to be a Ballerina. My name is Alexis. I am 6 years old . I like to watch TV. When I grown up I want to be a doctor. My name is Brandi. I am 6 years old. I like to play with my brother, Blair. When I grow up want to be a baby teacher. My name is Gerrod. I am 6 years old.I like to fight. When I grow up I want to be a vet. My name is Taylor. I am 7 years old. I like to eat. When I grow up I want to be a teacher. My name is Darrell. I am 8 years old. I like to play with my friends. When I grow up I want to be a doctor. My name is Justin. I am 6 years old. I like to play. When I grow up I want to be a vet. My name is Christopher. I am 6 years old. I like to play on the computer. When I grow up I want to vet. My name is Kyle. I am 6 years old. I like to play computer. When I grow up I want to be a Fire Fighter. My name is Lindsie. I am 6 years old. I like to play hide and seek. When I grow up I want to be a Swimming teacher. My name is Stephanie. I am 6 years old. I like to play with my cat. My name is Shawn. I am 6 years old. Playing with my dog When I grow up I want to be a golfer. My name is Kerry. I am 6 years old. I like to play in dirt. When I grow up I want to be a singer and dancer. My name is Michaela. I am 6 years old. I like to playing. When I grow up I want to be a singer. My name is Kayla. I am 5 years old I like to I like to play with my dog Penny. When I grow up I want to be a Artist. My name is Dillon. I am 6 years old. I like to play with Pokemon. When I grow up I want to get gold from the Olympics. My name is Katelyn. I am 6 years old. I like to play with pokemon. When I grow up I want to be a singer. My name is Joshua. I am 6 years old. I like to write in my Journal. When I grow up I want to be a cop. My name is Jacob. I am 6 years old. I like to play tag. When I grow up I want to be a gymnast. My name is Christopher. I am 6 years old. I like to play with my cars. When I grow up Want to be a fireman. My name is Ashley. I am 6 years old. I like to I play with my cat. When I grow up I want to be a teacher. 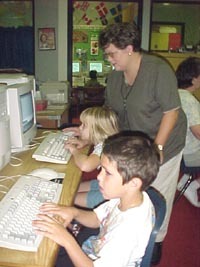 Hi first graders and Mrs. Campbell. You did a great job telling us about yourselves. Now we would like to share some things about us. My name is Sarah. I am 9 years old. I like to cheerlead. When I grow up I want to be a singer. My name is Brandon. I am 9 years old. I like to play soccer. When I grow up I want to be an accountant or a professional soccer player. My name is Kristien. I am 9 years old. I like to play outside. When I grow up I want to be a vet. My name is Courtenee. I am 9 years old. I like to cheerlead. When I grow up I want to be an artist. My name is Cady. I am 9 years old. I like to swim. When I grow up I want to be a teacher. My name is Lizzie. I am 9 years old. I like to cheerlead. When I grow up I want to be a doctor. My name is Morgan. I am 9 years old. I like to rock climb. When I grow up I want to be a social studies teacher.